What starts as a typical action film is quickly overcomplicated with too many characters and a roller coaster of genres. There is a vigilante prosecuting lawyer roaming the streets as well as a vigilante cop who is also a bit more sadistic. On the other side of the coin is a specialist female cop sent in to solve the vigilante murders and her rookie cop sidekick. At times Above the Law doesn’t seem able to choose between buddy cop, vigilante, action, suspense and comedy films, so instead they are all just thrown in and mixed around. There is no telling what the film might deliver from one scene to the next, and yet each fight scene is always sure to be the most entertaining part of the film. 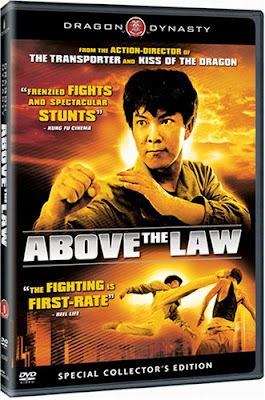 The action in Above the Law is typical Hong Kong full contact martial arts with a specific preoccupation with what feats the human body can accomplish. Although cars are used in the film they are more often an obstacle against a talented and swift human rather than used for chase scenes. One scene in which a character avoids several cars in a parking garage which are all trying to run him over is an impressively creative display of stunts. At the same time the stunts involving the white females in the cast are not quite as impressive, perhaps due to the fact that they obviously have stunt doubles which look nothing like them despite the best attempts. The DVD has an alternate ending, although I think I prefer the somewhat bleak original ending although it does seem strange considering the large amount of humor at the beginning of the film. 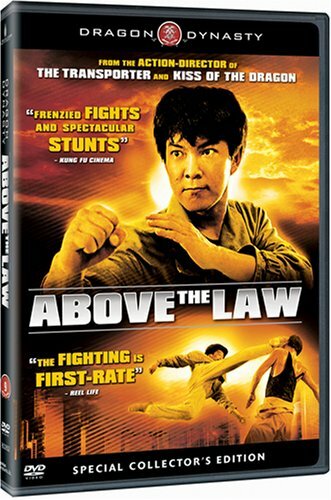 There is also a few interviews on the DVD, including one with producer and star Yuen Biao and leading lady Cynthia Rothrock. There is also a short featurette about Peter Cunningham, co-star and kickboxing champion. Once again Hong Kong Cinema expert Bey Logan gives his traditional commentary track about the film. There are enough facts to keep fans interested as always.